Though too modest to toot his own horn himself my co-editor and very dear friend Scott D. Danielson has made his very first professional sale and I think it is very newsworthy, even though it hasn’t yet been adapted to audio (yet)! 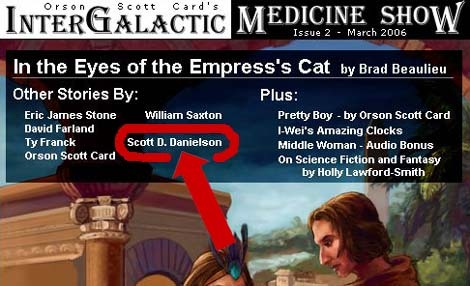 Scott sold his first ever short story to none other than the new online magazine Orson Scott Card’s InterGalactic Medicine Show! 1. Besides running SFFaudio Scott is working on another big site. His personal blog, SFFreader has primarily been a project in which he reads and comments on ALL of the Hugo and Nebula award winning short stories, novellas and novellettes. This neo-Hurculean task has already vastly deepened his already substantial knowledge of SF&F in the short form. 2. Additionally, a few months ago Scott and I had some discussions about what makes an SF story resonate with one person and not with another. When I asked Scott in a private skype conversation to “name a favorite Science Fiction story”, he named The Star by Arthur C. Clarke – a very good story but one that didn’t resonate with me the way it resonates with him. He then asked me to name one of mine and I named The Cold Equations by Tom Godwin – a story Scott hadn’t read at that time. Scott got a hold of a copy of The Cold Equations, read it and felt the same way I had about The Star. There was a distinct gap between the two tales as well as a gap between our two feelings about the stories. In my estimation, the gap was the difference between a meaningful universe and a meaningless universe. 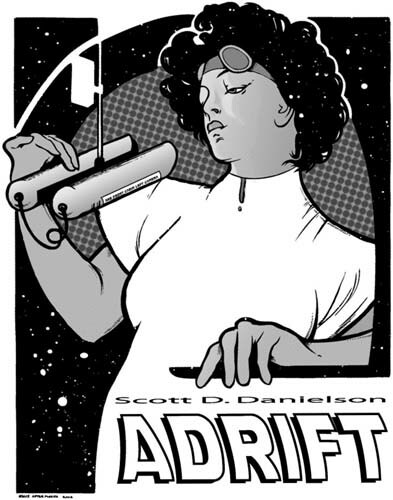 I think Scott agreed, because in my view Adrift bridges the gap between The Cold Equations and The Star quite effectively. Now I ask you is this mere coincidence? Or is it meaningful to you? Do yourself a favour and find out, Issue #2 of Orson Scott Card’s InterGalactic Medicine Show is only $2.50 USD and is available now! SSREP25 First Contact – Based on the story by Murray Leinster. Done a little different than the short story but well done. SSREP17 Simon Jones – A cool interview with Simon Jones, AKA Arthur Dent of the BBC’s Hitchhikers Guide To The Galaxy, and an exclusive to Spaceship Radio as far as I can tell. SSREP14 The Cold Equation (SIC) – Based on the story “The Cold Equations” by Tom Godwin. This is the Science Fiction story like no other, it cleaves its readers into one camp or another. Essential listening. SSREP09 The Green Hills of Earth – Based on the story by Robert A. Heinlein. It is elegiac Heinlein at his very best and a well done adaptation to boot.